Let’s start with some…real science. For a real detailed explanation of the science of sugars, specifically HFCS, I wrote about it in excruciating detail elsewhere. Really, read about the science of sugars, it’s important to this story. I’ll summarize here. There are over 20 naturally occurring simple sugars, called monosaccharides, found on this planet. All but four have any significant role in human nutrition: glucose, fructose, galactose, and ribose. Those are the only four sugars that can be absorbed by the gut and used by the human body. But things never are that simple. Many sugars we consume are disaccharides, or two simple sugars bound together. For example, table sugar is sucrose, a disaccharide made of one molecule of glucose bound to one molecule of fructose. When you consume sucrose, it is broken down rather easily into one molecule of fructose and one molecule of glucose, before your body can absorb it. This is not complicated, and it’s not anything magical, it just how it is. Sucrose has a unique taste that is found in brown sugar, molasses, beet sugar, and maple syrup–lots of places. In each of those, the sucrose is the same, and other “contaminants” give it different flavors, like the different “chemicals” that give maple its flavor. There are other common disaccharides that we eat, like lactose or milk sugar, which is glucose and galactose; maltose which is two glucose molecules; and a few dozen less common ones. Each disaccharide has a slightly different taste profile in pure form, and some rare disaccharides provide unique tastes to certain fruits and vegetables. But when these disaccharides enter the intestinal tract, they are quickly disassociated by water or acids plus enzymes into simple monosaccharides. To the body, whatever type of sugar you consume, in whatever form, and in whatever food, to be absorbed, it must be broken down to glucose, fructose, galactose, and very rarely, ribose. Therefore, if you read some bogus pseudoscience that this sugar or that sugar is better or worse for you, they all break down into simple monosaccharides, only four, just four, matter to human health. And the chemical structure of glucose, fructose, galactose, and ribose are exactly the same if they are in a pear, a bag of white sugar, manufactured in a chemical factory, or lovingly harvested from the nectar of a rare flower growing the headwaters of the Amazon. Like I said, all monosaccharides and disaccharides have different flavors from the human perspective. And they have different sweetness. For example, fructose is 1.73 times more sweet than sucrose despite having the same exact caloric content. So technically, you could use about 58% less fructose than sucrose to get the same sweetness. Yes, you read that right, fructose is so much sweeter than other sugars, less can be used to attain the same sweetness level. And fructose is a 100% “natural” chemical. Then what is high fructose corn syrup? HFCS consists of 24% water, and the rest fructose and glucose–the water just makes the fructose and glucose, no different than any other fructose and glucose on the planet, into a syrup. The difference between HFCS and table sugar, which is also fructose and glucose, is that because the chemical bond between fructose and glucose in the sucrose molecule is broken by the water in HFCS, and more fructose can be added to the syrup, something that cannot be done with sucrose. And because there’s more fructose, it’s sweeter, so less sugar can be used in the manufacturing of sweet foods. People think that HFCS is some new invention that has been destroying our food just for the last few years only. But that’s simply not true. In the 1950’s, an earlier version of HFCS, called invert sugar, was used to make candy and soda manufacturers to get more sweetness by using less sugar. It’s ironic that people who claim that sugary drinks of some mythical bygone era also used HFCS, it’s just that it wasn’t known by that name. Unless you were drinking Coke and Pepsi in the 1940’s, the taste difference is nothing more than a propaganda placebo. So why was HFCS developed? But here’s the most important point: HFCS allowed food manufacturers to use less sugar — and thus fewer calories — in their products without reducing its sweetness. Now, I’m not going to believe that food manufacturers are doing this to make their foods healthy. They’re doing it for one reason–cost reduction. But natural sugars are better!!! Apples: over 10% sugar, 57% fructose, 23% glucose and 20% sucrose. Very high fructose. Peaches: 8.4% sugar, 57% sucrose, 23% glucose and 18% fructose. Pears: 9.8% sugar, 64% fructose, 28% glucose and 8% sucrose. Grapes: 15% sugar, with the sugars being 53% fructose and 47% glucose. In other words, some of these “natural” foods have as high, or, in the case of apples, peaches and pears, even higher levels of fructose than HFCS. Remember, fructose is fructose. 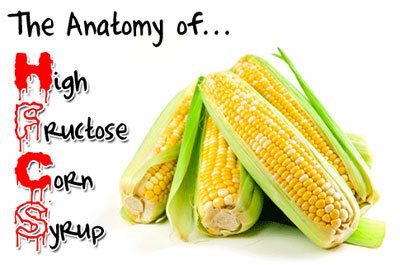 There is no chemical difference between the fructose created by plants or created by corn. It’s the same exact fructose molecule. The body thinks it’s the same. The body metabolizes it in the same way. To any organism in the world that can metabolize fructose (I don’t know if there are any that can’t, but I’m not sure), fructose is fructose is fructose is fructose. I hope that’s clear. There is simply no difference between the fructose and glucose in HFCS, and the fructose and glucose in table sugar. The chemical formulas are exactly the same. It’s the exact same carbons, the exact same hydrogens, and the exact same oxygens. No difference. It does not matter where you find the fructose or glucose, they’re all the same. Let’s go to some real medicine. Even though there really is simply little difference between various sugars that are eaten by humans, even though “high fructose” is sweeter and therefore less sugar is used, and even though all fructose is exactly the same, there is a continuing fear about fructose. Somehow, fructose is evil. It’s dangerous. It kills. Health implications of fructose consumption: A review of recent data–”A moderate dose (≤ 50g/day) of added fructose has no deleterious effect on fasting and postprandial triglycerides, glucose control and insulin resistance. There is no existing evidence for a relation between moderate fructose consumption and hypertension. Fructose may induce hyperuricaemia, but mainly in patients with gout.” In other words, eating moderate amounts of fructose have no ill-effects. The issue remains that if you eat too much fructose (and any other sugar), there are deleterious metabolic effects, and that should be the major issue. Evidence-based review on the effect of normal dietary consumption of fructose on development of hyperlipidemia and obesity in healthy, normal weight individuals–” The results of the analysis indicate that fructose does not cause biologically relevant changes in TG (triglycerides) or body weight when consumed at levels approaching 95th percentile estimates of intake. So, there really is nothing there. Based on these meta reviews, the scientific community is coming to a consensus that HFCS is fairly safe. Now, don’t misinterpret this data. It doesn’t mean you can go drink a liter of pure HFCS every day and have no consequences. Because there are. As I’ve written before, no not really, HFCS is not correlated to diabetes. Some people have speculated that there could be a link between HFCS and type 2 diabetes mellitus (T2DM), a metabolic disorder generally thought to be caused by lifestyle issues such as obesity. As some background, the basic monosaccharides, galactose, fructose, and glucose, are each metabolized in a different pathway by humans. Glucose is processed through the liver, but remains unchanged, and is used by all cells in the body for energy purposes. 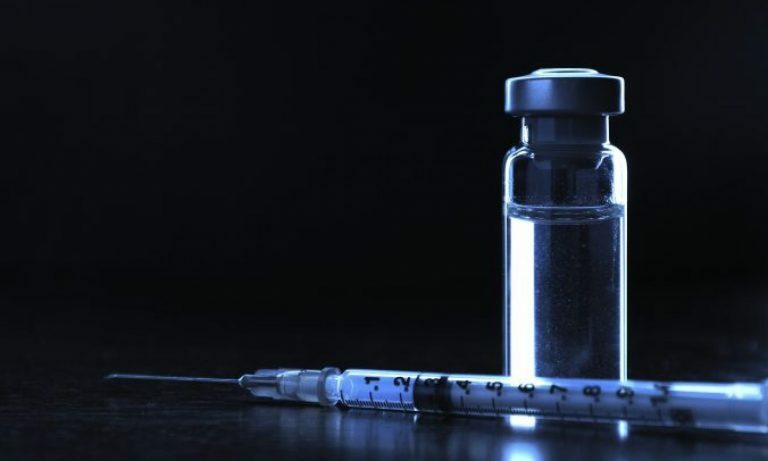 The level of glucose is controlled by the hormone insulin, which induces cells to store glucose if blood levels get high, and glucagon, another hormone critical to blood glucose levels, is released when blood sugar levels drop, inducing cells to glucose from storage. This control system is highly complicated, and as long as an individual is not diabetic, the blood glucose level remains finely tuned over 24 hours. It’s actually an amazing system, with highly interesting evolutionary history. Nearly the same insulin floating in our body can be found in the simplest animals, including insects and crustaceans. On the other hand, fructose and galactose don’t signal insulin. However, those two sugars are captured by the liver, eventually converted into a couple of different biochemicals, one of which is glucose. See this is an extraordinary complex system, which people oversimplify. Because fructose is metabolized differently, there has been some speculation that fructose might be implicated in T2DM. Except, there are some problems with this view linking fructose and T2DM. For example, fructose has a very low glycemic index of 19 ± 2, compared with 100 for glucose and 68 ± 5 for sucrose. Because fructose is 1.73X sweeter than sucrose, diabetics can consume significantly less fructose (than other forms of sugars) for an equivalent level of sweetness. Studies show that fructose consumed before a meal may even lessen the glycemic response of the meal. In other words, specifically because of the sweetness and lower insulin reactivity, fructose may actually be preferred for those who are attempting a low glycemic index diet. Now, I am oversimplifying how all of these sugars interact in human physiology. It would take a 1000 page book to scratch the surface. However, there is just not any convincing and plausible evidence that shows fructose, as opposed to all other monosaccharides, has some specific and unique effect on human metabolism. High quality meta reviews of the research into any correlation between HFCS and T2DM or other metabolic conditions have consistently have shown no consistent and clinically significant relationship between the consumption of fructose and any metabolic disease. We could cherry pick a few poorly designed epidemiological studies, but they don’t provide us with convincing evidence of a link. We do have evidence that any sugar can lead to obesity, whether it’s from maple syrup, HFCS, table sugar, or your local ice cream shop. So the Food Babe is wrong? About beer she is. HFCS in your beer is not going to do anything. Maybe if you’re some aficionado, and can tell me, through blind testing, that an HFCS containing beer tastes differently than a non-HFCS, I could accept that (though probably not, because I think blind tastings are bogus). And I guess there could be some flavor difference. As far as I can tell, the Food Babe gets upset about any strange chemical name, because, she lacks an education in chemical names and what they are and they aren’t. She recently had a fit about Starbucks Pumpkin Spice Latte, based on her arrogant and ignorant understanding of “chemicals.” She thinks that every chemical is horrible, yet our world is made of nothing BUT chemicals. If she really wanted to do this, why doesn’t she analyze all of the chemicals in coffee itself! Hey it contains a crystalline xanthine alkaloid, methyltheobromine. The Food Babe is simply inventing things as she writes, just to get hits and to feed what appears to be her enormous ego. Maybe she does have a useful message that drinking a kale smoothie is better and cheaper than a Starbucks’ drink, but it should be about the calories or cost, not about some mysterious chemical. The Food Babe is solidly unknowledgeable about actual physiological effects of these chemicals. As for beer, I never check labels. I know if it tastes good or not, based on my previous experience. And I don’t like warm beer. Who cares if it contains HFCS, unless it made it taste terrible. Then we should protest. Nevertheless, it probably will still taste better than a kale smoothie. 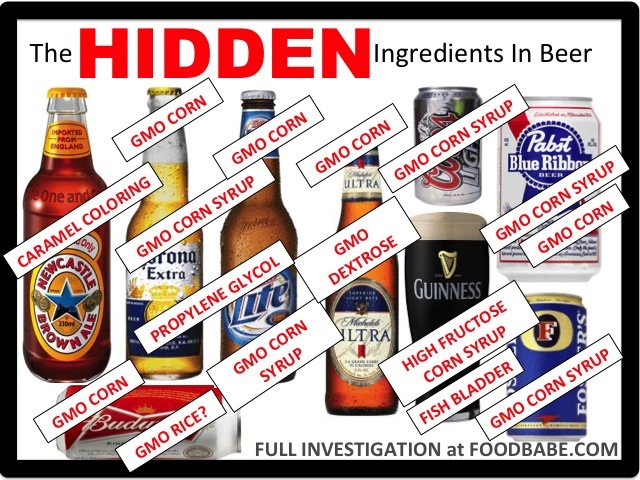 Some beers contain high fructose corn syrup, according to the Food Babe. High fructose corn syrup is just two simple sugars connected together in water. All of its components are the same carbons, hydrogens, and oxygen atoms that are found everywhere in nature. 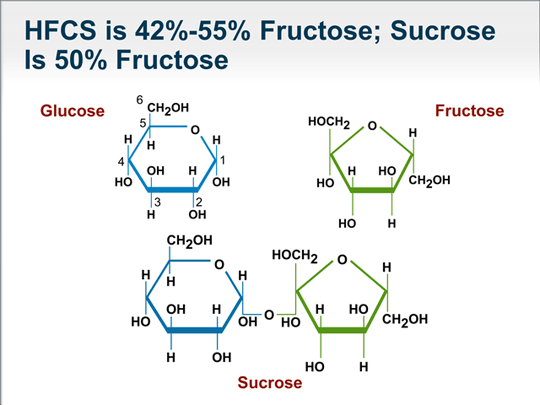 The fructose and glucose components of HFCS are exactly the same as all other fructose and glucose in nature. HFCS probably has no effect on metabolic diseases, such as Type 2 diabetes, no more than any other sugar or foods. The Food Babe is wrong. Dolan LC, Potter SM, Burdock GA. Evidence-based review on the effect of normal dietary consumption of fructose on development of hyperlipidemia and obesity in healthy, normal weight individuals. Crit Rev Food Sci Nutr. 2010 Jan;50(1):53-84. Review. PubMed PMID: 20047139. Sievenpiper JL, de Souza RJ, Mirrahimi A, Yu ME, Carleton AJ, Beyene J, Chiavaroli L, Di Buono M, Jenkins AL, Leiter LA, Wolever TM, Kendall CW, Jenkins DJ. Effect of fructose on body weight in controlled feeding trials: a systematic review and meta-analysis. Ann Intern Med. 2012 Feb 21;156(4):291-304. doi: 10.7326/0003-4819-156-4-201202210-00007. Review. PubMed PMID: 22351714. Tappy L, Lê KA. Metabolic effects of fructose and the worldwide increase in obesity. Physiol Rev. 2010 Jan;90(1):23-46. Review. PubMed PMID: 20086073. Previous PostPrevious OK, why aren’t kids getting vaccinated with Gardasil?